Buy or Rent Traceroute (2016) Movie DVD & BluRay Online! Movie Plot: Artist and life-long nerd Johannes Grenzfurthner is taking us on a personal road trip from the West Coast to the East Coast of the USA, to introduce us to places and people that shaped and inspired his art and politics. 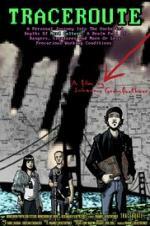 Traceroute wants to chase and question the ghosts of nerddom’s past, present and future. An exhilarating tour de farce into the guts of trauma, obsession and cognitive capitalism.